Hackaball Review - A Programmable Computer You Can Throw! Hackaball is a programmable electronic device inside a protective ball. Kids can create their own games with the Hackaball iPad app and then play them indoors or outdoors. 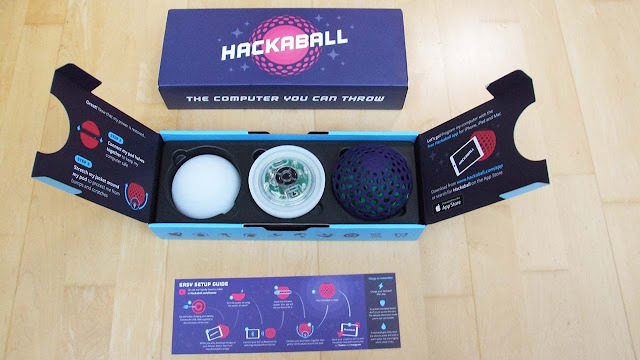 Hackaball started off as a crowdfunded Kickstarter project and comes from UK start-up Many by Many. We interviewed Seb Potter last year when the product was under development. The idea behind Hackaball is to create a programmable toy that encourages kids to get physically active. In this hands-on review we'll look at the device in detail. The Hackaball electronics board is visible in a clear plastic case so you can see the components. Everything is nicely designed and we love the look of the mesh covers. The covers are gorgeous bright colours - green and purple which will appeal to girls and boys. A USB cable is included for charging. Our Hackaball arrived with some charge which is nice. It has a power switch on the board, you can turn it on and try it out without the app - it comes with a demo program that shows off its lights. 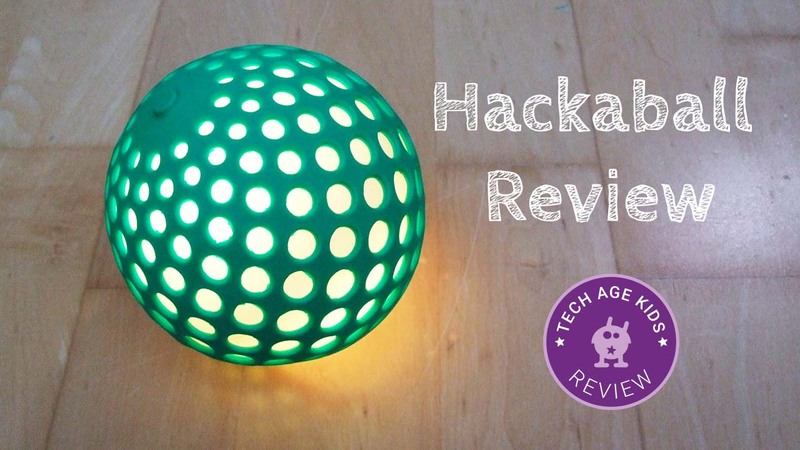 Hackaball looks awesome with the coloured light shining through the holes in the mesh. The Hackaball app was quickly found in the Appstore and it walked us through a firmware update. You have to shake the Hackaball during pairing - this means that you can have multiple Hackaballs in the same place. It's easy to put the other half of the cover on to Hackaball to turn it into a ball. Adding the mesh cover that goes over this is more fiddly and kids won't find it easy to do this by themselves. You need to turn Hackaball on before you put the cover on, otherwise you'll have to take it apart again. This is a bit frustrating as you don't really want to be taking it apart when you've taken it to the park to play. The ball itself seems pretty sturdy once it has its covers on. You feel like it will cope with being thrown around and dropped. The app comes with some demo programs and games. These are created using visual blocks and you can see the 'code' for the demos which is good. We did sometimes find that an app wouldn't start because a previous app was still running but we would still get the GO screen for the new app. This was a bit confusing until we worked out what was going on. Disconnecting and reconnecting the Hackaball did the trick in this case and got the new app running. The interface for creating your own apps is nice and simple, just right for the 6-10 audience that Hackaball is targetting. We ran the app on an iPad 4 and it worked although it did freeze occasionally and was a little unresponsive. 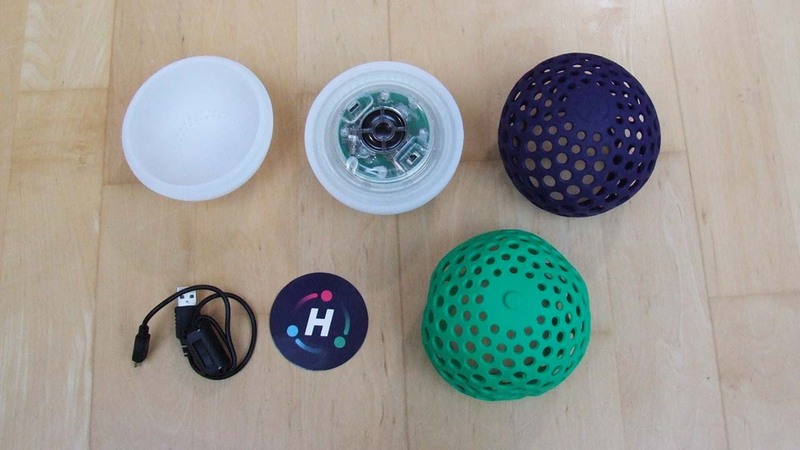 Hackaball has a set of actions that can be triggered when events occur. So you could make the ball go red and play a sound when it detects that it has been dropped. Hackaball has a motion sensor and can detect various kinds of motion including being thrown, dropped and shaken. It has RGB LEDs, a speaker and a vibration motor for lots of fun feedback. There's a limited set of sound effects that you can use, more would be good and the maximum volume on the speaker isn't especially loud which will make it hard to hear in a noisy environment or outside at the park. It's nice to see an alternative to Blockly-style apps. A lot of effort has been put into designing a simple interface that works well with an event-based style of programming. Once you've got Hackaball into its case (and remembered to turn it on!) then it's a really nice ball to play with. It's a good size for young kids to play catch with and it feels pretty robust. Hackaball looks gorgeous and the coding app works pretty well once you get the hang of it. My kids had a lot of fun with Hackaball. It's so much better than having a special purpose electronic toy that can only do one thing. You can really get kids into coding and technology by letting them make things that are meaningful to them. And what's more useful to a kid than a toy? Rather than just nagging kids to be more active and spend less time passively consuming technology we need to use technology to encourage kids to spend their time more productively. Having to take the Hackaball apart to turn it on and off adds a bit of friction to playing with it, especially outside the home, but it's worth the effort. The app was also a little slow and crashed sometimes on our older iPad 4. But that didn't slow us down much. Hackaball isn't currently available to buy. Sorry. But they are planning another production run and you can sign up to be notified at the Hackaball website.